Caffeine is found in more than morning beverages—scientists estimate that 55 percent of flowering plants also produce caffeine in their nectar, which draws in consumers like honeybees. 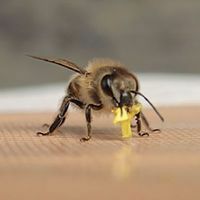 In a recent study, nectar spiked with caffeine led honeybees to return—and direct their hivemates—to the food source more often than to an uncaffeinated feeder, researchers reported in Current Biology last week (October 15). 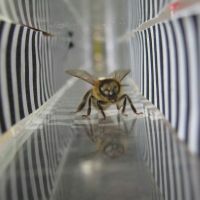 A team from the University of Sussex, U.K., led by Margaet Couvillon, trained honeybees to forage from one of two feeders. One provided an average nectar sucrose solution, while the other was spiked with caffeine (though otherwise identical). The researchers tracked the bees with tiny number tags, and saw that honeybees feeding from the caffeinated feeder returned more often, even when the feeder was empty. “These poor bees came back for four or five days afterwards, and they were kind of desperate,” Couvillon told New Scientist. 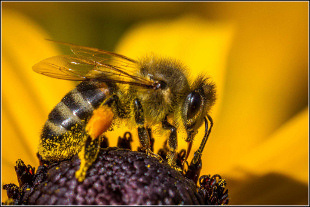 The bees also performed their waggle dance, a behavior used to direct other bees from the hive to the food, more often for the caffeinated feeder. 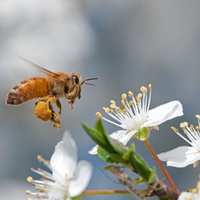 Caffeine “causes the bee to overestimate the quality of the resource,” Couvillon told The New York Times. 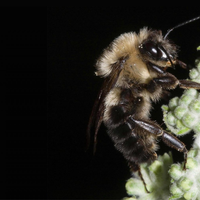 The compound entices the bees to visit more often—and therefore collect more pollen from the plant—potentially without the plant actually spending energy to create a higher-calorie nectar. “It’s presumably cheaper for the plant to produce a small amount of caffeine than a large amount more sugar,” study coauthor Francis Ratnieks told BBC News.